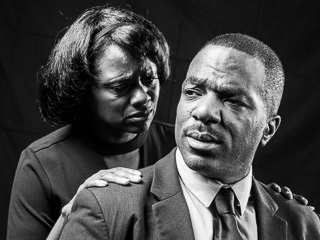 Karen Malina White as Camae and Gilbert Glenn Brown as Dr. Martin Luther King, Jr. Winner of the prestigious Olivier Award for Best New Play, The Mountaintop is rife with humor and political jabs, while giving us a glimpse at the human side of Martin Luther King Jr. Hours after his famed final speech, punctuated by the immortal line, "I've been to the mountaintop," the celebrated Reverend reveals his hopes, regrets, and fears, creating a masterful bridge between mortality and immortality. In 2018, America and the world marks the 50th anniversary of the death of Martin Luther King Jr., yet, struggles to resolve racial tension remain a challenge for communities everywhere.